As you might know, I'm a little bit of a fan of the music of Josh Wilson, so seeing 'Live From The Carson Center' was going to be released, let's just say I was a little bit excited. 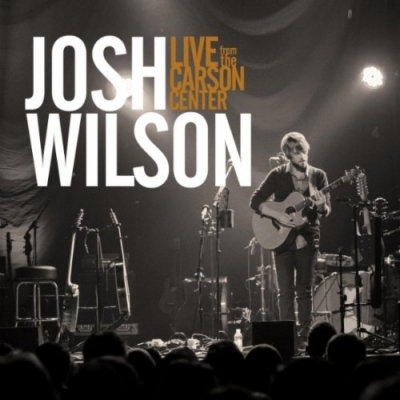 Read More As you might know, I'm a little bit of a fan of the music of Josh Wilson, so seeing 'Live From The Carson Center' was going to be released, let's just say I was a little bit excited. The live album was recorded during the 'Songs & Stories Tour' with Steven Curtis Chapman. Josh Wilson, the young musician first hailed as 'the future of Christian pop' by Gospel Music Channel and recently honored as the ASCAP Christian Songwriter/Artist of the Year, released his latest studio album 'See You' in February with great reviews. Josh has taken some of the best songs on that album and recorded them from his live tour. Sometimes live recordings don't come across as well as expected, in comparison to the album they appeared on. But tracks like I Refuse and Before The Morning sound truly stunning. Josh's voice sounds great live, if you liked it on the album in tracks like Fall Apart then you will love it on the live album even more. Mainly using an acoustic guitar, Josh has a very rich tone guitar, that sounds great live. It sounds even better during the instrumental version of Amazing Grace, which I was surprised to see on the album, why not just sing it? But, and it's a big but, the song sounds amazing, using a delay pedal to bulk out the acoustic sound (which does make it sound very U2). It is funnily enough my favorite track on the album just for the pure creativeness of the song and actually trying something different, as it isn't like many versions of the song you will have heard. Always Only You sounds so great, I love this song, and love this version even more with a few acoustic guitars and a little extra piano work. Josh sings that loving chorus to his wife of "I'm gonna love you always, the good and the bad, baby I still do, cause it's always only you". The whole song is about falling in love with the one true love. I just love this song and this version is pure brilliance. So how to sum up this album in a short few witty words? Well, I wish it was actually longer. Josh is a great singer and guitar player who seems to shine much more live, which comes across in these songs. I just wish I could experience some of these in a live setting at a Josh Wilson gig myself, but since flying to America is costly, I think this EP with this set of songs is the perfect alternative without paying a few hundred pounds on flights. That will keep the wife happy.